PicCollage is one of my favorite Android and iPad apps. It is a free that allows you to quickly arrange pictures, video, text, and stickers into collages. From the app you can share your collage to Google Drive, Instagram, Facebook, Dropbox, and many other file sharing services. In the video below I demonstrate how to use it without creating a PicCollage account. Below the video I have five ideas for using in your classroom. 1. Students can develop collages to use as visual introductions of themselves to their new classmates at the beginning of the school year. Have your students create a collage of things that they like to do for fun or their favorite things about school. 2. As an exercise in blogging without writing your students can create collages to summarize a fun day, a weekend, or what they learned during the week at school. 3. When the holiday greeting card season approaches, consider having students create and send digital greeting cards that they develop on PicCollage. 4. As part of a book report assignment have students develop book covers for books they've read. Along the same lines, have them create collages about their favorite parts of books that they have read. 5. Students who struggle to get started on a descriptive writing assignment could benefit from first creating a photo collage about the event or concept that they need to write about. In thinking about the images that they select, they're also thinking about what they will say about each image. 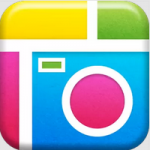 Update: Terri Eichholz suggests using PicCollage for creating mini-yearbooks. Read her post here.